First what is Quinoa, and how do you even pronounce it? Originating in the Andean region of South America, Quinoa is commonly pronounced as “KEEN-wah”. 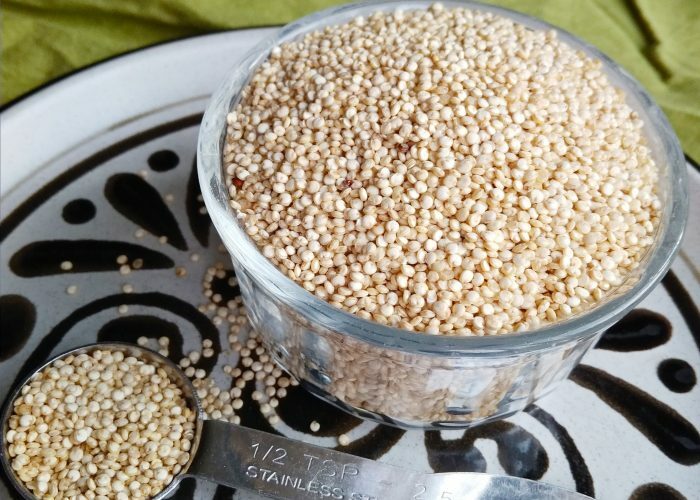 Unlike rice, wheat or maize which are grain cereals, quinoa is a pseudocereal that is actually more related to amaranth and spinach, in which its seeds are harvested. According to a 2011 Food Agricultural Organization’s report on Quinoa, “Quinoa is the only plant food that contains all the essential amino acids, trace elements and vitamins and contains no gluten. Essential amino acids are found in the nucleus of the grain, unlike other cereals, like rice or wheat, in which they are located in their exosperm or hull.” This amazing nutrient dense plant crop is very versatile and can be grown in various climates. Although there are thousands of varieties of quinoa and varying colors (white, black, red), these varieties can be largely grouped into 5 umbrella ecotypes. The main producers currently of quinoa are in Bolivia, Peru and the United States, but cultivation is spreading to Europe and Asia. Nutritionally, quinoa really stands out. It is calorically dense and is also high in protein. Just a ¼ cup of uncooked quinoa (4 tablespoons) already provides 6 grams of protein, 156 calories, 3 grams of fiber, 1.9 milligrams of iron and 1.3 milligrams of zinc. It is also a source of folate, magnesium, phosphorus, potassium, B vitamins, vitamin E and fatty acids. As a comparison, a similar amount of unenriched white glutinous rice (1/4 cup uncooked) provides only 3.1 grams of protein, 1.3 grams of fiber, 0.7 milligrams of iron, 0.6 milligrams of zinc, and smaller amounts of all the other micronutrients. Quinoa is very versatile in the kitchen. It can be used in baked treats, in breakfast porridge, in slow cooker dishes, as a taco filling, in salads or eaten as the main starch in a main course meal. If you are not used to the texture of quinoa but would still like to use it, try quinoa flakes. These cook up to a texture similar to oat porridge. A note about quinoa preparation: although nowadays much processing has been done to commercially sold quinoa to remove its thin outer coating containing bitter-tasting saponins, to be sure you can still rinse or wash the quinoa seeds under cold running water in a fine mesh sieve, before cooking it. Then cook it in a pot using the ratio of one cup of quinoa to two cups of either water or a fortified plant-based milk. Once the mixture begins to simmer and bubble, let it boil gently for 5 minutes then turn off the stove and cover the pot with its lid. Let the pot sit for 20 minutes covered. After 20 minutes, lift the cover and quickly check (by trying a small amount of the quinoa using a spoon) to see if the quinoa has been cooked through. If not, you may add a little bit more water or fortified plant-based milk (if the texture is looking relatively dry) before closing the lid and letting the quinoa sit for 5 – 10 minutes longer or until fully cooked. Note that recipes vary in whether they use cooked or uncooked quinoa in the cooking process, so check preparation instructions. Quinoa: An ancient crop to contribute to world food security. Food and Agriculture Organization. July 2011. Accessed July 16, 2018. Great post ! I find your note on the preparation very useful, thanks. Thank you Megala, I am glad you found this post on quinoa helpful! Very informative post , great to read about it! Thank you Nisha for your encouraging comment!